The production of recombinant calpastatin in E. coli has become an efficient tool to obtain discrete amounts of a specific calpastatin species that can be present concomitantly with other calpastatin fragments/forms in the same tissue or cell type in a given condition. Indeed, at present, it is still difficult to distinguish the various calpastatin species for several reasons among which: calpastatins differ only at the N-terminus, can undergo calpain-dependent cleavage generating discrete fragments, and show anomalous electrophoretic mobility. Another benefit of using recombinant calpastatin is that, as the wild-type forms, it is heat resistant and thus can be efficiently isolated taking advantage of a simple quick purification step. Finally, the lack of posttranslational modifications makes recombinant calpastatin species particularly suitable for studying in vitro the biochemical features of specific parts of the inhibitor that following controlled posttranslational modifications change their functional interaction with calpain. In this chapter, we describe, starting from the mRNA sequence, how to produce rat calpastatin Type I in E. coli. We use routinely the same method, with minor modifications, for the production of other calpastatin species deriving from different tissues or organisms and calpastatin constructs having only specific domains. 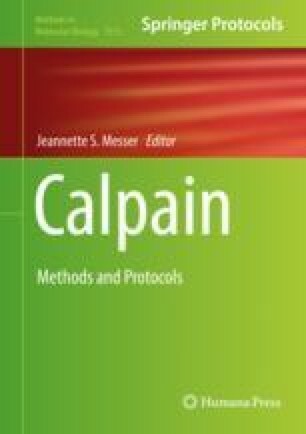 The possibility to obtain large amounts of a single calpain inhibitor form is a great advantage for studying the calpain/calpastatin system in vitro. This work was supported by the grant FRA2015 and FRA2016 from University of Genova to MA and RDT.